Experience counts. As a practicing California Notary Public and in the capacity of a full time mortgage loan document specialist I am one of the first notaries certified as a signing agent by the National Association of Signing Agents now part of the National Notary Association. Since becoming a Notary I have reached the significant milestone of notarizing over 15,000 legal documents. 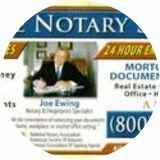 Attorneys looking for a full service Notary/process server should note that I have the years of experience needed to handle your client as well as your documents. I am also patient and kind with your elderly clients whilst notarizing Living Trusts, Powers of Attorney and Health Care Directives. APOSTILLES on documents notarized by me are usually completed in one day.